I can only imagine what it would have been like to live in the mid- to late-nineteenth century, desperately wanting out of a bad marriage, and feeling not only trapped, but that a court-ordered divorce was beyond my reach. I shouldn’t be surprised that many resorted to such ‘arrangements’, where a woman conceivably talked her lover into making a gentleman’s agreement (and a little transfer of money to sweeten the offer) with the soon-to-be-“former” husband, such that the woman could go her way with the man she loved (or found to be a better prospect). Keep in mind that people separated all the time. Men walked out on their families and “disappeared”. Women left their husbands (when they could manage) with or without the children. Sometimes those deserters allowed their former spouse and children to believe them dead, intentionally. Many remarried, though without a divorce was obviously illegal (and they would’ve been charged with bigamy had they been caught). Some bothered to change their names, some never did. All a woman had to do was go West (where the law was more diluted), go by an assumed name, and if pregnant or with children, spread the word she’d been widowed in order to protect her “good name”, and most who met them had no resources by which to verify a thing. Why would a man “buy” somebody else’s wife? Custom. See the two places within the article where I share the English custom (among the peasant class), that naturally made its way to the colonies and then the United States with emigrants from England. “Same“, he believes, as a divorce and marrying her himself (far-fetched, but near the end of this article, you’ll see things differently). 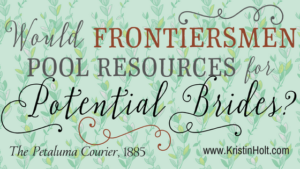 After all, women were property (chattel)…and “brand new” ones, straight from the producer, were scarce on the frontier. 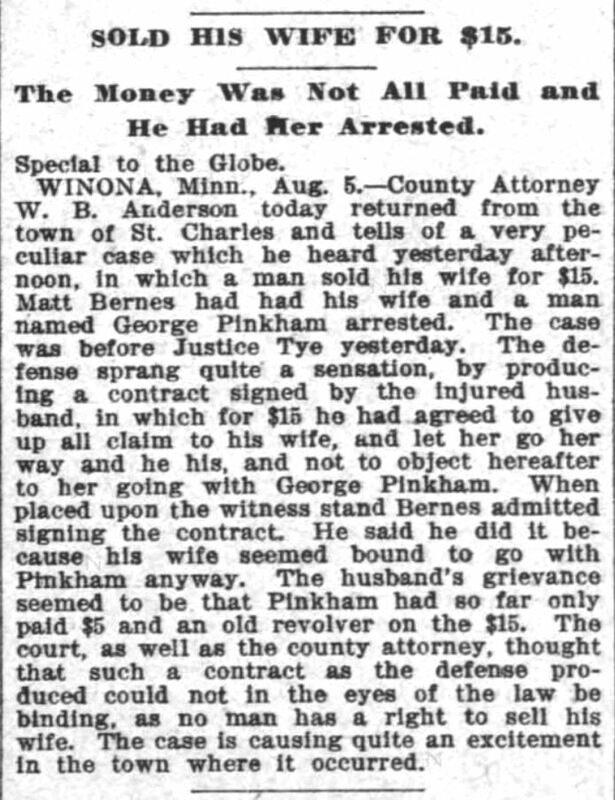 Already having an affair (or cohabitation)–so payment of damages to her rightful husband might assuage his conscience. Women did a tremendous amount of work–while men did their own sunup to sundown, back-breaking work. Most single men couldn’t get along without a help-meet (to plant, tend, and harvest a garden, cook, launder, milk the cow(s), muck out stalls, sew, weave, tend any children, preserve meat, can fruits and vegetables, butcher, make soap, tend chickens and sell extra eggs, be the home economist (who made cheese, butter) and traded at the store. A household simply wasn’t operational without both the man’s work and the woman’s. I’m the first one to admit that just because somebody said it doesn’t make it true… and just ’cause somebody published it in a newspaper (or book or magazine or blog post) doesn’t make it true. That said, take these (seventy!) snippets from various nineteenth century newspapers with a grain of salt. By the end, you draw your own conclusions. Historians learn to evaluate the surviving documentation that time leaves behind, and to present it in an unbiased manner (well beyond my training and capabilities), but I’ll share my hypothesis along the way–I’ll flag my hypotheses in turquoise blue. Look! Someone wrote a novel with this premise! Truth? Or a widespread mockery of marriage? A bunch of Americans (and English, and Canadians), ignorant of the law? Or wives who wanted out and this seemed the most prudent way to get out of a disastrous marriage and into one with a much kinder man? 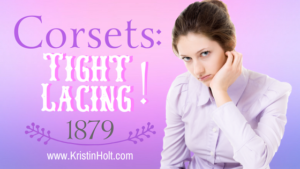 Fed-up husbands, wanting to scare their lazy wives onto the straight and narrow? Hold on–and don’t give up before the list is through. Some of these entries are dead serious. Some, I’m certain, actually did occur. “SIDE SPLITTERS” column of Bismarck Weekly Tribune of Bismarck, North Dakota on February 18, 1886. 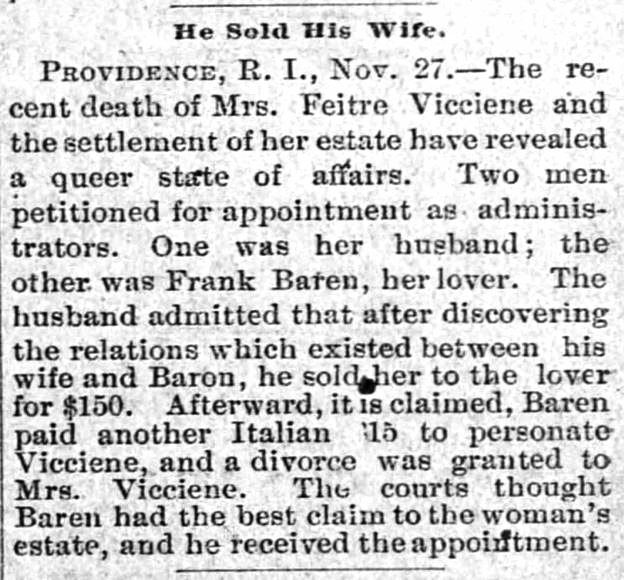 Reference to “A Vermont man sold his wife…” is near the center of the article body, paragraph #3. Okay, some are definitely jokes. 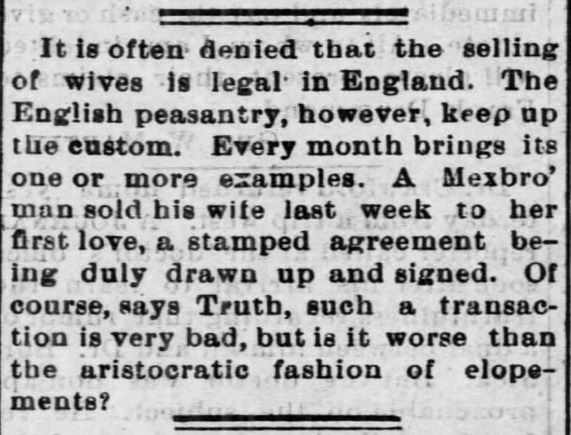 Nineteenth century humor aside, how is a casual newspaper reader (like some of the men who evidently sold their wives–referenced in later newspaper snippets) to know that such borrowed English tradition (from the lower/lowest classes) was illegal? The New York Times of New York, New York on December 2, 1883. AMERICA LAW BORROWED ENGLISH LAW? Our modern American law system is based on centuries of English principles regarding right and wrong. This English common law system combines with U.S. case decisions and statutes to form what we know as law. 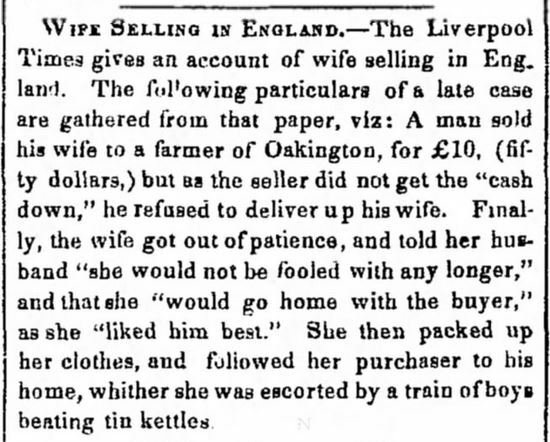 It’s highly possible that some who’d heard glimmers and bits about “selling a wife” either believed or wanted to believe such a thing was plausible. At least in this case, a woman knew her man had walked out on her, and she supposedly had someone else to rely on for support and protection. Legal? No. Moral? No. Did it happen? I bet it did. Green-Mountain Freeman of Montpelier, Vermont on December 13, 1844. Did such a ‘tradition’ come from England? See the following five newspaper announcements were for circumstances purportedly occurring in England, follows by one of Canada. 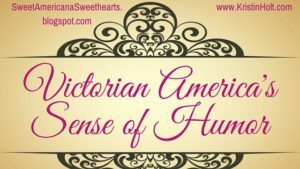 Or did such misogynistic humor come from England?… or, if this is entirely American humor (we do know the straight-laced Victorian Americans did show a surprising sense of humor). To today’s reader, much of the humor isn’t funny at all. Women are no longer chattel in any sense of the word. Note– the first two evidently speak of the same occurrence. Two newspapers, one week apart, retell the same story (passing news along from other papers was quite common). Does this mean Daily Eagle staff chuckled at the quip in The Jeffersonian? Or was it legitimate news? The Jeffersonian of Stroudsburg, Pennsylvania on May 13, 1847. The Brooklyn Daily Eagle of Brooklyn, New York on May 20, 1847. 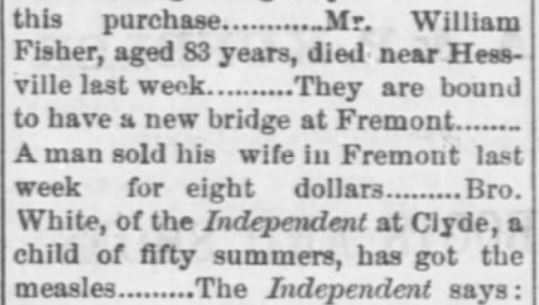 Waukesha Democrat of Waukesha, Wisconsin on January 15, 1850. The Louisville Daily Courier of Louisville, Kentucky on August 20, 1852. I believe it’s possible such comments–such as “Wife Selling in England”, above, and “the Leeds, England selling of wife for cohabiting with someone else” is a “moral warning” to husbands to exert their God-given rights as head of the household, with all the rights (legally and morally), to keep their wives’ behavior under control. Natchez Daily Courier of Natchez, Mississippi on December 29, 1852. 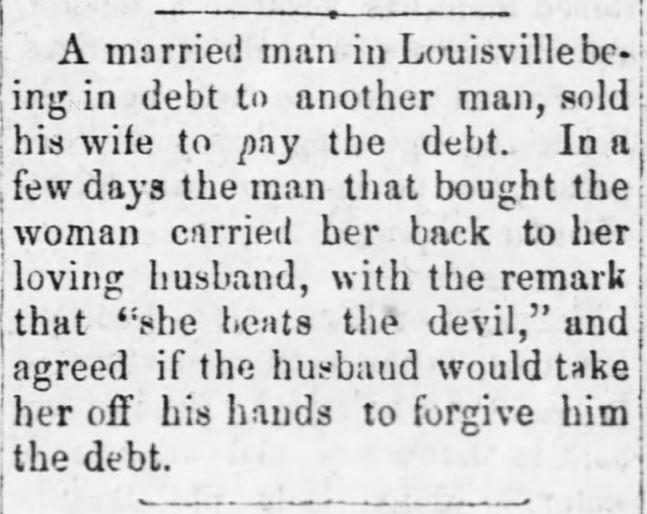 Cincinnati Daily Press of Cincinnati, Ohio on October 22, 1860. Wilmington Journal of Wilmington, North Carolina on May 24, 1866. Comment: Sometimes, the content seems simply bogus. Married an eleven year-old-girl? “In another Michigan town”–okay, that’s not verifiable. This “Matrimonial.–” posting, above, could easily be nothing ore than a newspaper’s attempt to fill space with something eye-catching. Victorian newspapers often posted fictional snippets or short stories posed as reality. The Brooklyn Daily Eagle of Brooklyn New York on October 18, 1866. At Lyndon, a man sold his wife and children to another and started for Utah. The purchaser is still pleased with his bargain. 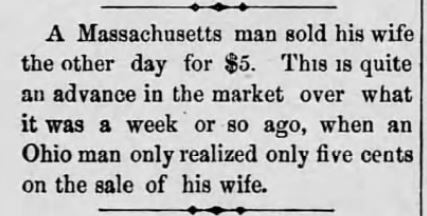 ~ Hartford Courant of Hartford, Connecticut on September 24, 1867. Hartford Courant of Hartford, Connecticut on September 24, 1867. Not meant to be readable; see transcription, above. The Burlington Free Press of Burlington, Vermont on January 17, 1871. The Home Journal of Winchester, Tennessee on February 23, 1871. The Tiffin Tribune of Tiffin, Ohio on March 21, 1872. Fayetteville Observer of Fayetteville, Tennessee on October 10, 1872. The previous snippet from Fayetteville Observer (Tennessee) seems like one of those “good ol’ boys” nod-nod, wink-wink comments from one man to another in the predominately male-run newspaper, male-readership of newspapers… that “some wives are just downright difficult, disobedient, trials in a man’s life”. Of course the man who sold her to pay his debt was a “loving husband”, and the sold wife? “She beats the devil”. Nice. The Times-Picayune of New Orleans, Louisiana on February 12, 1873. The Rutland Daily Globe of Rutland, Vermont on June 6, 1873. Wow. $5,000+ is no small chunk of change. I think several men today would part with less-beloved wives for that kind of money. 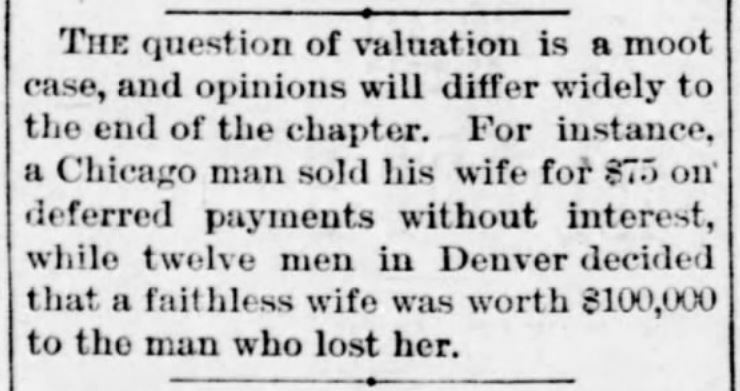 Disgusting to think about, but I bet some men would see the “sale” as an easy way out of a marriage that wasn’t all that rewarding (read: “worthless”, in an 1873 man’s vernacular…won’t work herself to death?). 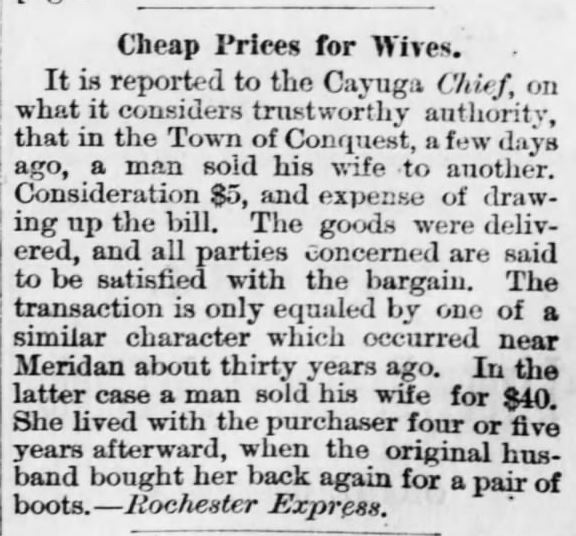 Note the comment on line 3 to 4: “A party…bearing resemblance to a man, sold his wife to a man”…as if the seller, by social expectations of the time, did not qualify as a “man” due to his impudent behavior, but the buyer does? Pittsburgh Daily Post of Pittsburgh, Pennsylvania on June 10, 1873. The Worthington Advance of Worthington, Minnesota on May 23, 1874. What cost $5 in 1874 would cost $107.73 in 2016. The previous paragraph from The Worthington Advance (Minnesota) strikes me as a quip–a laugh about the truth many men could understand, man-to-man…that some women were hellcats. Especially when bodily threatened by sale into essential slavery. I know some men were hen-pecked then, as well as some men are today. I’m never one to justify domestic abuse–not men towards women and not women towards men. Husbands deserve the same decent (abuse-free) treatment as do women. Note the 10x rise in expenses, from what the man supposedly achieved (in cash) for the sale of his wife, compared to what it will cost him to get well (in doctor’s fees, medicines, time off work, etc. )–I guess. Detroit Free Press of Detroit, Michigan on April 18, 1875. Star Tribune of Minneapolis, Minnesota on May 6, 1875. What cost $2,000 in 1875 would cost $44,378.92 in 2016. 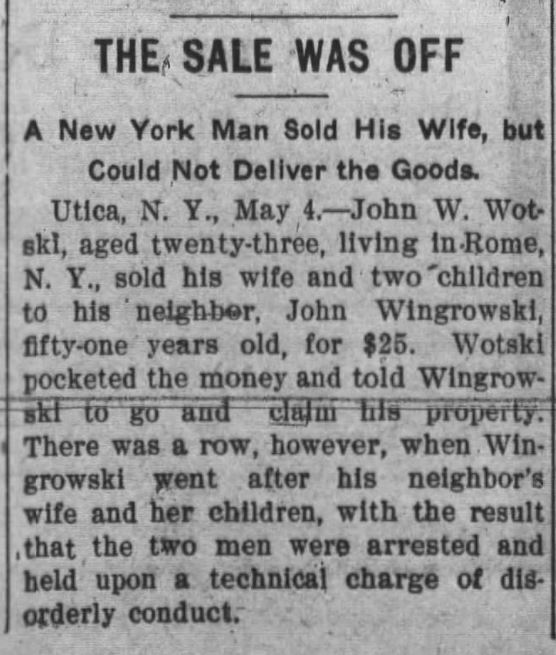 Given the grandiose “payment” for this wife in Weld County, Colorado–more than $100,000 in today’s money–the buyer was either a millionaire (the term meant something then) from the gold and silver strikes of the era, and he found somebody else’s wife he didn’t want to live without…or it’s a hoax. 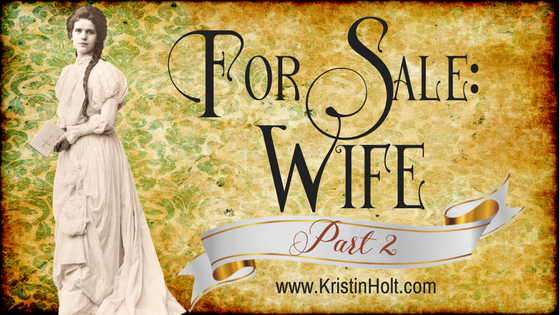 A tale meant to show just how “valuable” some men think other men’s wives are. King Nebuchadnezzar aside. A tidbit–Weld Co., Colorado isn’t among the mining districts of 19th century accurate history. With Greely as the current county seat (perhaps always has been)…Weld County is just east of Fort Collins and slightly north-east of Denver. Plains–not mountains. Maybe that’s where the mining mogul lived. Plenty of incredibly wealthy people lived in Denver in the 1870s. Atchison Daily Patriot of Atchison, Kansas on May 18, 1875. Pittsburgh Daily Post of Pittsburgh, Pennsylvania on August 16, 1876. 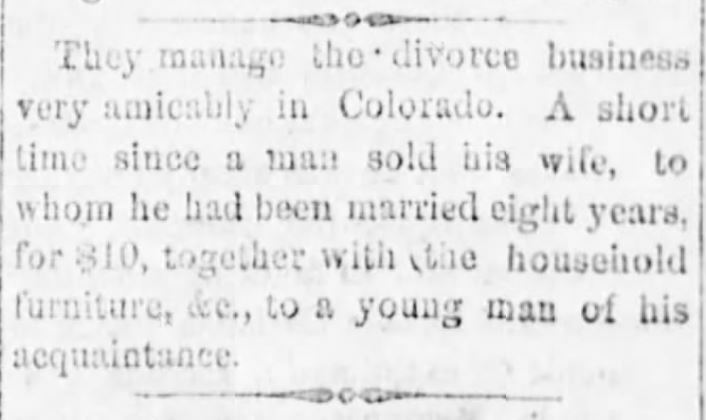 The (above) snip from Pittsburgh Daily Post (Pennsylvania) of 1876 sounds an awful lot like the 1873 snip (Rutland Daily Globe, Vermont)–7 newspaper snippets above. Urban legend? Harrisburg Telegraph of Harrisburg, Pennsylvania, on August 18, 1876. Green Bay Advocate of Green Bay Wisconsin on December 20, 1877. National Republican of Washington, District of Columbia on December 28, 1877. What cost $50 in 1877 would cost $1,143.79 in 2016. The Osage County Chronicle of Burlingame, Kansas on January 22, 1880. Given the Philadelphia Times, picked up by The Osage county Chronicle (Kansas) is complaining about street car fares of a similar rate, this smells like a quip. 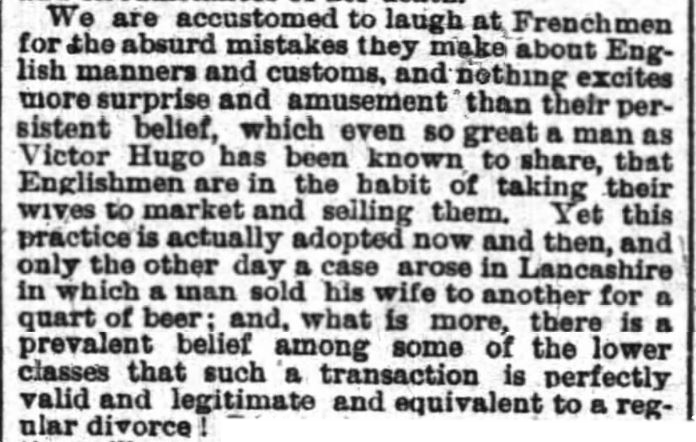 But honestly–would so very many references to “selling wives”, even if men wished to high heaven they had such an option, appear in papers if there weren’t a grain of truth at the bottom of it all? 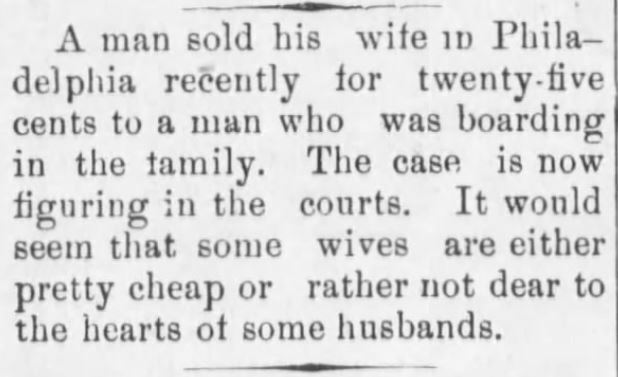 The Osage City Free Press of Osage City, Kansas, on September 23, 1880. First printed in the Cayuga Chief, then Rochester Express, then Free Press (of Osage City, KS). Sold. And bought back? After four or five years? 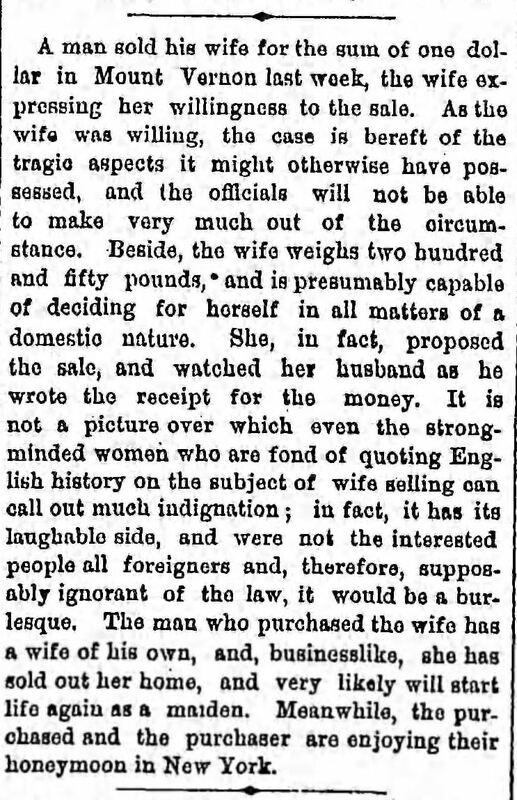 This following article is one of several I’ve come across about the peasantry in England sincerely believing that selling one’s wife (the custom, at least) is a viable substitution for divorce (expensive, hard to obtain, etc.). While the practice may not have occurred constantly, it certainly occurred enough for word-of-mouth to have made it common knowledge. And, as most of the early emigrants to North America were English, hence the English-speaking majority (in the early years) and English as the official language, naturally the customs trailed along. The Topeka State Journal of Topeka, Kansas on July 29, 1881. The Brooklyn Daily Eagle of Brooklyn, New York on August 24, 1881. 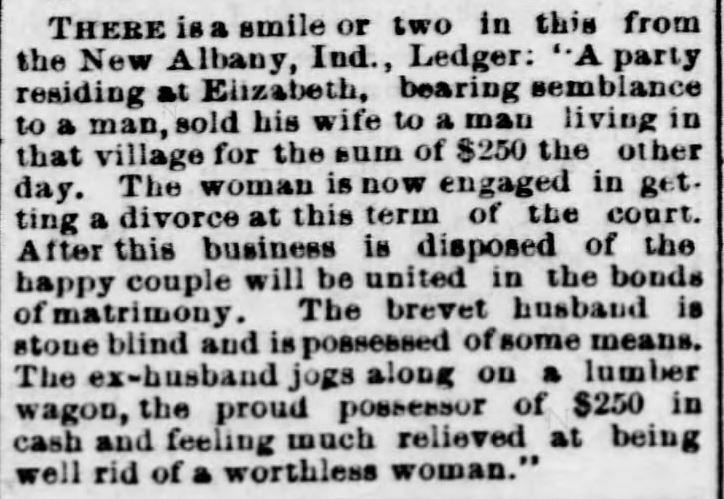 The previous article from The Brooklyn Daily Eagle (New York) is the closest we’ve seen illustrating a woman’s choice to leave a man she no longer wished to be saddled to, and, with that soon-to-be-former husband’s “blessing”, start her life free of encumbrances with her new man. Honeymooning and all. This longer column also references the law, to which the parties (all foreigners) were ignorant–not aware, fully, that such a custom isn’t legal, and holds no water in a court of law. I imagine some sort of divorce decree had to have been issued by the powers that be before the purchaser could wed the purchased. The Atlanta Constitution of Atlanta, Georgia on October 21, 1881. 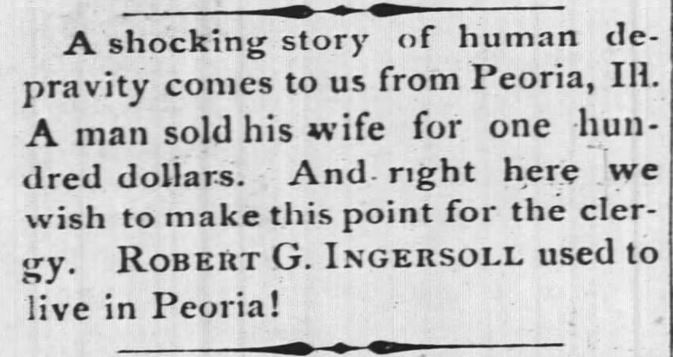 The Waterloo Press of Waterloo, Indiana on March 9, 1882. 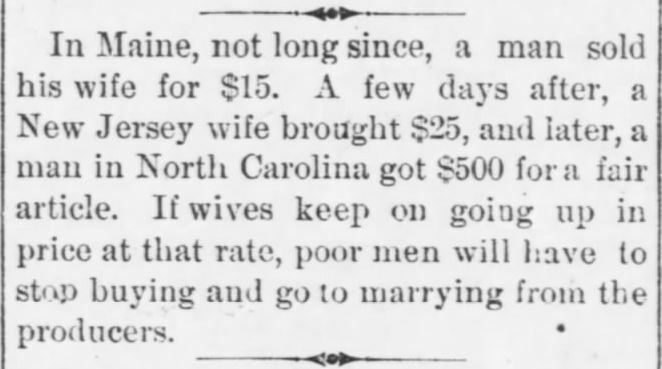 The Winston Leader of Winston-Salem, North Carolina on March 21, 1882. Note: The Winston Leader (immediately above) is the only paper, thus far, to express outrage (and moral high ground) to the very idea that a man might have sold his wife. The Montgomery Advertiser of Montgomery, Alabama on December 26, 1882. The Bourbon News of Paris, Kentucky on February 13, 1883. Bismarck Tribune of Bismarck, North Dakota on August 31, 1883. Owosso Times of Owosso, Michigan on November 23, 1883. 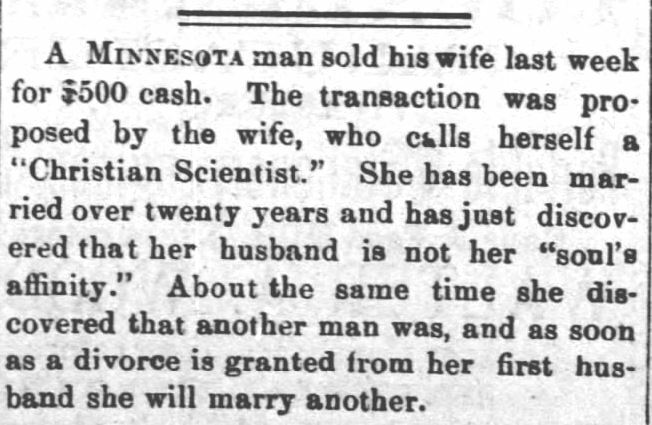 Bismarck Weekly Tribune of Bismarck, North Dakota on June 20, 1884. The New North-West of Deer Lodge, Montana on April 11, 1884. If a truthful bit of news, the woman wanted out and would’ve gone anyway. The following three snippets appear to come together–did someone write one half of the fictional tale, and someone write the other? OR…was the baby actually the buyer’s? OR…was the woman and baby in a horribly abusive relationship, and the “good guy”/hero buyer willing to spend the money to liberate her? Harrisburg Telegraph of Harrisburg, Pennsylvania on June 20, 1885. The Daily Deadwood Pioneer-Times of Deadwood, South Dakota on June 25, 1885. The Pulaski Citizen of Pulaski, Tennessee on June 25, 1885. The Sunday Leader of Wilkes-Barre, Pennsylvania on January 3, 1886. Harrisburg Telegraph of Harrisburg, Pennsylvania on January 18, 1886. The Austin Weekly Statesmen of Austin, Texas on January 28, 1886. Tunkhannock Republican of Tunkhannock, Pennsylvania on February 5, 1886. Democrat and Chronicle of Rochester, New York on February 9, 1886, from Norristown Herald. 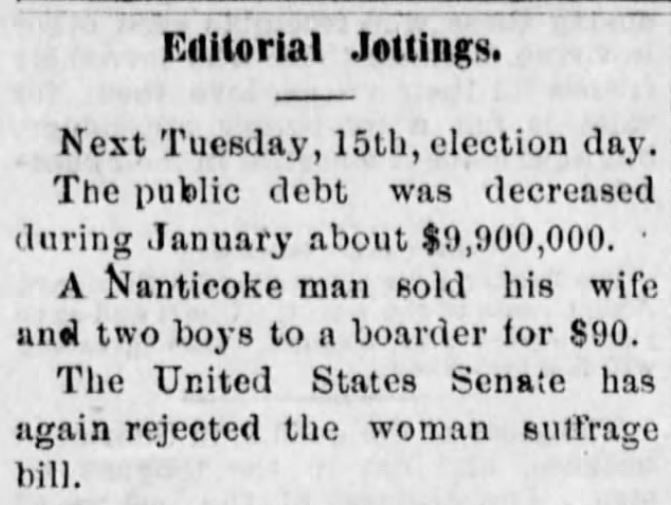 See two short lines in middle of this snip, beginning with “A Nanticoke man…”: Lewisburg Journal of Lewisburg, Pennsylvania on February 9, 1887. New York Tribune of New York, New York on March 25, 1887. 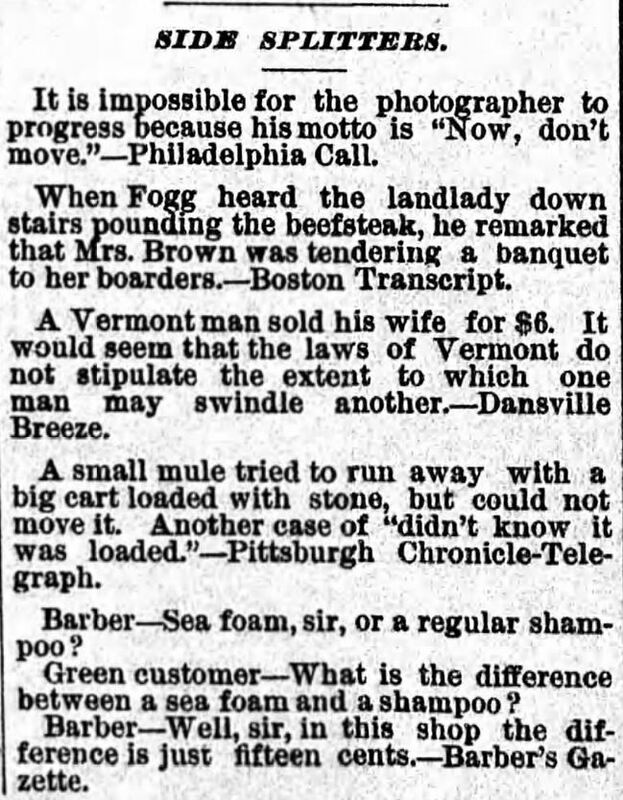 Harrisburg Telegraph of Harrisburg, Pennsylvania on June 29, 1887. Arkansas Democrat of Little Rock, Arkansas on August 27, 1887. 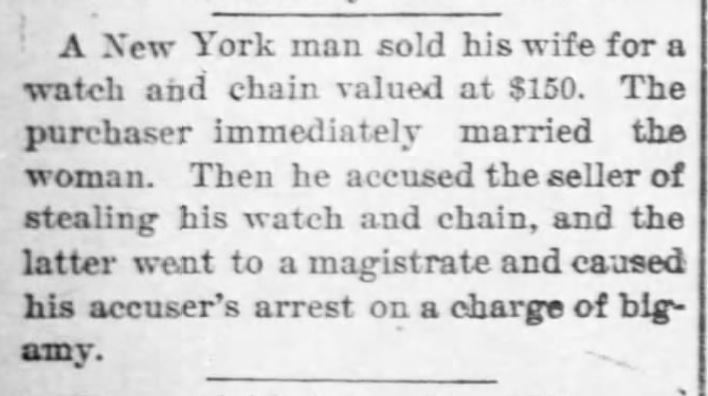 Poughkeepsie Eagle-News of Poughkeepsie, New York on August 30, 1889. The Clarion-Ledger of Jackson, Mississippi on October 31, 1889. The Caldwell News of Caldwell, Kansas on December 18, 1890. The St. Joseph Herald of St. Joseph, Missouri on August 2, 1891. The Dalles Daily Chronicle of The Dalles, Oregon on November 28, 1891. Another reference of suing for alienation of affections, and perhaps a joke entirely, comparing East and West. The Wilkes-Barre News of Wilkes-Barre, Pennsylvania on March 9, 1892. 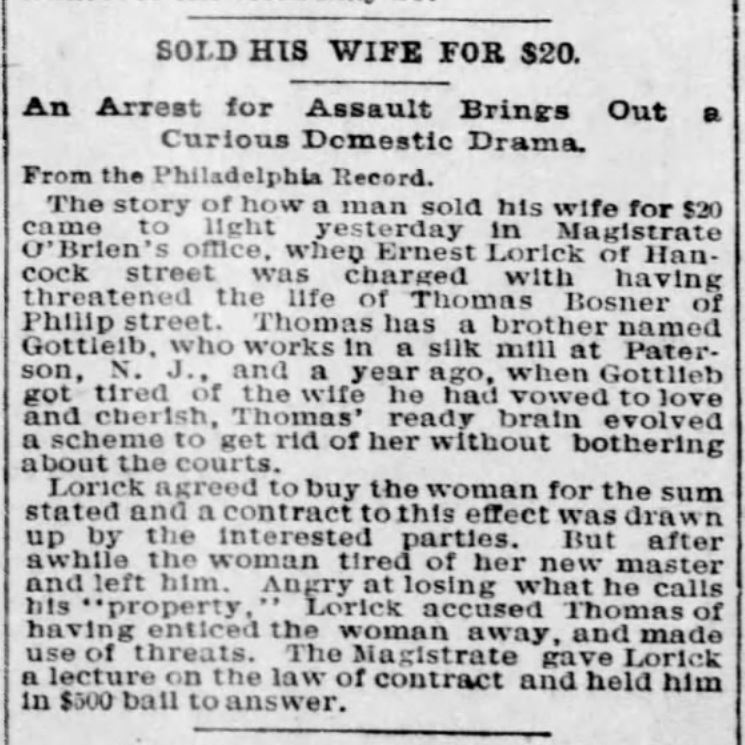 St. Louis Post-Dispatch of St. Louis, Missouri on March 15, 1892, from the Philadelphia Record. The Shippensburg News of Shippensburg, Pennsylvania on August 12, 1892. The Record-Union of Sacramento, California, on September 26, 1894. 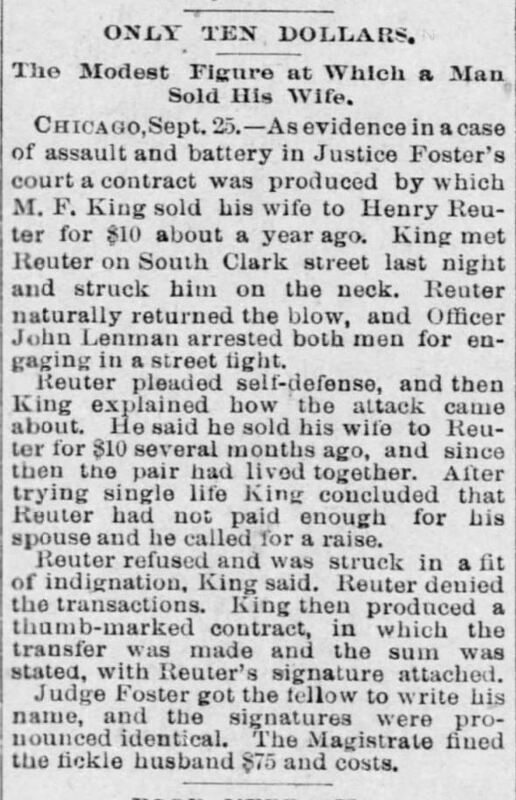 The Public Ledger of Maysville, Kentucky on March 22, 1895. Oswatomie Graphic of Oswatomie, Kansas on November 20, 1896. The Atchison Daily Champion of Atchison, Kansas on October 2, 1897. AH! This one made it to a court of law! Given the Scranton Truth (newspaper) by syndicate to The Wilkes-Barre News reported whose court the Van Nort – Marcy issue was presented, the following tale seems to have a bit more credence. If a judge actually addressed the issue, it must have been real…right? The Wilkes-Barre News of Wilkes-Barre, Pennsylvania on February 8, 1899. The Saint Paul Globe of Saint Paul, Minnesota on August 6, 1896. 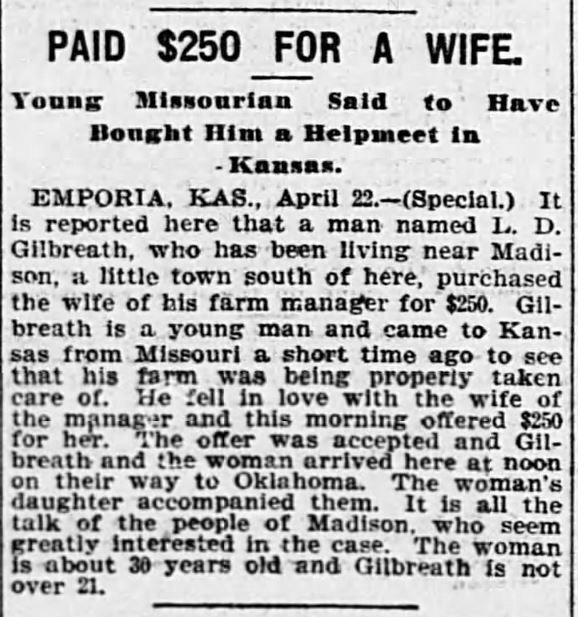 Kansas City Journal of Kansas City, Missouri on April 23, 1899. The Alexandria Times-Tribune of Alexandria, Indiana on May 5, 1910. The Houston Post of Houston, Texas on June 22, 1910. 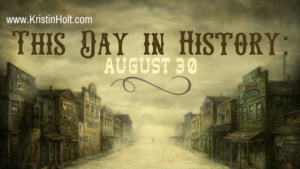 Have you ever heard of anything quite so bizarre, or so widespread, during the nineteenth century in the United States? I’d love to hear about it! 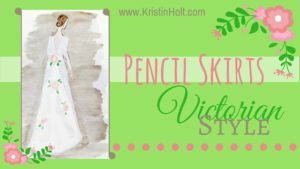 Likewise–what are your thoughts about this subject? Is it all a hoax? Do you agree with my assessments (notes along the way in turquoise)? Disagree? Please scroll down and reply. 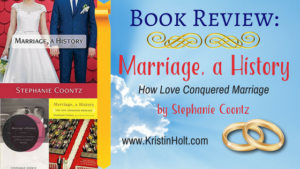 My review of a book I “read”/listened to over the past week or two, that taught me so very much about how marriage evolved over the centuries and brought about the love-based marriage we enjoy (or not) today. 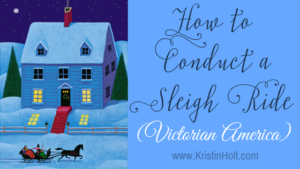 Don’t miss my 5-star review! See the contrast of “love-based marriages” from August 30, 1860 & 1867. The first is a husband and wife, separated by the Gold Rush (California, 1847), and ‘miraculously’ reunited in 1860. The second, an article titled “Most Brutal Love Affair”–a man who eloped with somebody else’s wife, leaving his own to die in childbirth. 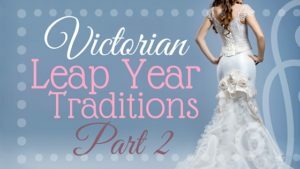 Who said the Victorian Era was “the good old days”?